Driving for work is a high-risk activity. It is estimated that as many as one in every three road collisions involve people driving as part of their jobs. But employers have a duty of care to their employees who drive in the course of their employment. That's the blunt message delegates attending a Driving for Work Risk Management conference in Dublin are hearing today. National Vehicle Distribution (NVD) transports vehicles in Ireland. It has 145 transport trucks, and 150 truck drivers. NVD is keenly aware of its obligations as an employer to keep its employees safe while driving for work. The company regularly updates its fleet of trucks to make sure they are safe, modern and environmentally-friendly, and it has reduced the age of its fleet from 5.5 years to 3.6 years. It also runs a preventative maintenance programme. NVD invests heavily in driver training. Drivers take part in a 13-week classroom and field training programme that covers all the statutory requirements and more. "We make sure our drivers are very well supported when they start in their roles, and we also provide a refresher programme, " said Amanda Manley, Head of HR with NVD. "They are constantly kept up to date." A dedicated telematics system monitors NVD drivers, providing each driver with daily and weekly feedback. "We try to identify negative trends very early, " Ms Manley said, and drivers can log any near miss incidents on an app, to inform colleagues and improve safety. "We did our own training videos. We did one which demonstrated how to avoid a tail swing, to highlight the dangers. It's NVD specific and our drivers can relate to it." The company also awards safe driving practices with bonuses. National Vehicle Distribution is a case study in best practice when it comes to reducing the risks for employees who drive for work. It is good for business, and has paid dividends by reducing driver turnover from 50% in 2014 to 6% in 2017. Safe driving for work should be a key part of a company's health and safety management system, just like manual handling, according to the Health & Safety Authority. Deirdre Sinnott McFeat, a Senior Inspector with the HSA, works on the related vehicle safety programme. "Employers have a duty to put in place arrangements that ensure workers' protection while they use the road for work, in the same way that they put procedures and arrangements in place in the workplace for dealing with the risks that employees face there," she said. "We are finding that employers are not really aware of their legal responsibilities in this regard." While drivers are responsible for how they drive, employers have duties in helping to make driving for work safer, she said. Every employer has a duty of care to their employees, to take measures to ensure that work-related journeys are safe, members of staff are able to drive safely, and all vehicles and associated equipment are fit for use. Be aware of the risks associated with driving for work. 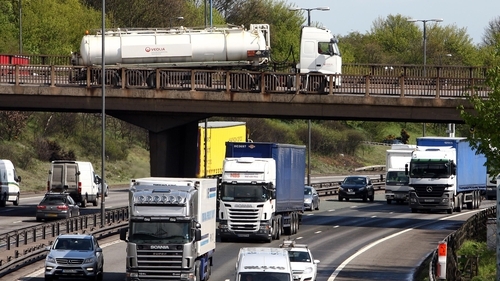 If you have people driving for work, you have a duty of care to manage the risks. Put a policy in place that makes a commitment to manage your driving for work risks. Carry out a risk assessment of driving for work practices. Implement appropriate controls and procedures to manage the risks effectively. Reduce as low as possible the risk of collision associated with some of those risk factors like the "killer behaviours" of speed, distraction, fatigue, intoxication and use of safety belts. Moyagh Murdock, chief executive of the RSA, said businesses need to ensure that road safety is a key consideration in the awarding and selection of any contracts. "If you do outsource contracts remember that you cannot outsource your responsibility to road safety," she said. The Road Safety Authority, the Health & Safety Authority, and An Garda Síochána have been involved in educating employers and employees on their responsibilities in relation to driving for work and ensuring that the risks associated with driving for work are reduced. "This education programme combined with our enforcement activity will ensure that professional drivers are fully licensed, compliant with drivers’ hours and tachograph legislation, as well as being up to date with their Certificate of Professional Competence obligations," said Assistant Commissioner Michael Finn, An Garda Síochána. "In addition we will, in conjunction with the RSA and HSA through our multi-agency checkpoints, check commercial vehicles for safety defects, ensure that vehicles meet road safety standards and that all health and safety legislation requirements are met." The Driving for Work Risk Management conference in Dublin is organised by the European Transport Safety Council, the Road Safety Authority, the Health & Safety Authority and An Garda Síochána.